The Cliffs of Moher are a breath-taking stretch of elevated coastline located in County Clare along Ireland’s famous Wild Atlantic Way. 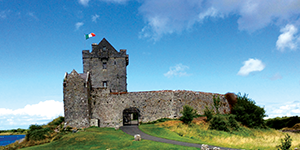 In Gaelic, the native tongue of Ireland, ‘Mothar’ means ‘the ruin of a fort’. The cliffs take their name from the demolition of a former promontory fort that stood triumphantly on on the coast until the early 19th century. 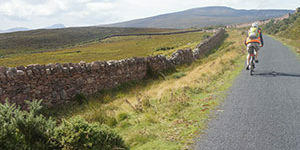 The walls of rock are 214 metres high and are spread along approximately 8km of the Wild Atlantic Way, which is home to some fabulous walking and cycling trails. The Cliffs of Moher have become one of Ireland’s most popular tourist attractions, and the site has been named on many prestigious world travel lists such as Lonely Planet’s ‘Top 500 places of all time’. 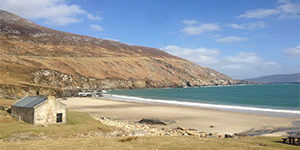 Conde Nast Traveler ranked the Irish landmark as the best ‘cliff view’ on the planet. You won’t find many better spots on Earth for photography. The cliffs appear in iconic images of Ireland spread across the globe that capture the unblemished landscape of this little green island. 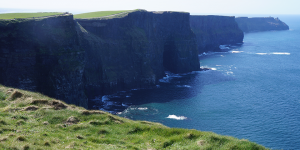 Ireland has a diverse population of wildlife and there’s no better place to experience this than at the Cliffs of Moher. 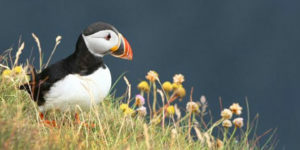 The iconic Puffin bird is thriving in the area, and they can be seen playing and pottering around in the nooks and crannies dotted along the stretch. Other birds that call Co. Clare’s coastline home are the white bellied Guillemot and the majestic Fulmar. The Peregrine, one of the fastest mammals on the planet is part of the falcon family. You’ll need to be quick to snap a picture of one of these little guys as they can move at a speed of up to 240km per hour! Marine life is also rich in the Ocean beneath the cliffs, and if you’re lucky, you can spot whales, seals and even sharks in the distance. Film and Television directors have been aware of the beauty of the Cliffs of Moher for a long time. The unique landscape has made it a favourite for fantasy filmmakers. Excalibur (1981) and Harry Potter and The Half Blood Prince (2009) used the magical backdrop of the cliffs to portray a location that was beyond the world as we know it. You might have spotted the cliffs in some famous music videos too, notably Westlife’s ‘My Love’ and Maroon 5’s smash hit ‘Runaway’. 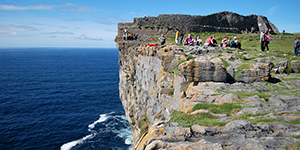 If you are looking to visit the cliffs of Moher as part of a short walking tour we’d recommend The Burren Way. 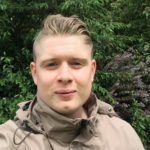 On this route you’ll also visit some quaint Irish villages such as Lahinch, Doolin and Corofin where you can experience traditional Irish culture and cuisine, and of course a pint of creamy Guinness. If cycling is your thing than you can cycle the full Wild Atlantic Way on an amazing 53 night adventure along the spectacular coastline. You can also use our tailor made booking system to customise a shorter cycling trip, selecting a route that’s perfect for you! I am hoping to take a trip to Ireland soon. This will certainly be an option I plan to look at when I start planning.